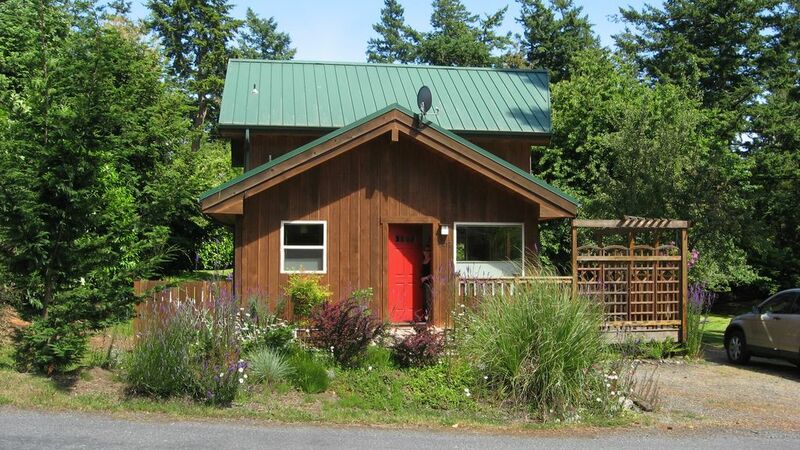 Olga House is situated in the hamlet of Olga located on Orcas Island, Washington. Orcas Island is the largest island (in sq. mi.) of the San Juan Islands, tucked between the state of Washington and Canada on the Strait of Juan de Fuca. Olga House is a cedar home, with vaulted ceilings throughout, and towering front windows facing south. Equipped with all modern conveniences and located by pristine Buck Bay where you can go boating, fish, sail, or kayak. Private buoy off of Olga Dock comes with the home. Olga has an historic post office and a post-card perfect store (Olga Store is not open at this time). A short walk away is Orcas Island Artworks, a wonderful local arts & crafts gallery, along with a delightful cafe. Olga is a destination for islanders and visitors alike. Moran State Park is less than 2 miles away, and features lakes, trails for walking and mountain biking. Mt. Constitution is in Moran State Park and is the highest location in the San Juan Islands. Eastsound, the largest 'town' on Orcas is less than 15 minutes away. Live in Portland, Oregon. We have been going to the San Juans since college - many years ago. Grab your favorite refreshment (and company) and hang out on the dock and enjoy the absolutely spectacular view. Watch eagles fly overhead, and the ferries and sailboats in the distance, and be mesmerized by the silence at night. Eastsound is about 15 min away by car. It is full of art, book, clothing shops, great bakeries and restaurants, brewery, grocery stores and delis. Buck Bay is a few steps away and from Olga Dock you can cruise by boat all over the San Juan Islands, west to the US mainland, north into the Strait of Georgia, and west to Victoria and Vancouver. Olga is situated 15 miles from Eastsound, the main "town" on Orcas Island. It is surrounded by water and islands and forested mountains. The hamlet of Olga is a small bayside community anchored by the historic Olga Post Office, Olga Store (closed), and the Artworks with arts, crafts, and a cafe restaurant. Filtered view out over Buck Bay, which is in the Strait of Juan de Fuca, in the San Juan Island chain. Fabulous for kayaking with glass-smooth surface many days of the year. Electric heat pump, gas stove. Several board games, cards, misc. Dinghy, only highly experienced people should use this. Kept on dock during summer season. Ask in advance to use this. Large deck, three sides of home, three separate sitting areas, including a private deck off of master bedroom. Dock is 1st come, 1st served. Private Olga House buoy available in the bay. Art gallery and cafe within walking distance. Lovely light, spacious home in the village of Olga. Very well stocked kitchen for those who want to cook. Beds amazingly comfortable. Nice outdoor deck with views of the historical Olga store and post office. The deer come right into the back yard. Less than a block from the Olga dock. The Olga House is a gem. Sitting out on the the deck with a view of the water and deer wandering through the yard was so relaxing. The kitchen is large and well-appointed. We cooked all our meals. Great location, near Moran Park and Obstruction Pass Park. Quick one block walk to the Olga dock. Only good things to say about this property. We just loved this house. The kitchen was well stocked with everything you could need to cook your meals. Everything was so nice and clean. It was like being at a home away from home. So quiet & peaceful. We can’t wait to go back next year. We all loved our stay in Olga! Beautiful house with all the amenities that we enjoyed in the rain and the sun. Perfect retreat every time we visit Orcas. Will build vacations around when this place is available!!! Thanks again!! Pilot your boat from the mainland (Bellingham, Anacortes, Seattle...) directly to Olga House. Private buoy guarantees moorage if Olga Dock is full. You can fish, crab, bird watch, and kayak right off of Olga Dock.